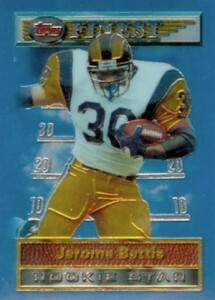 While 1994 Topps Finest Football was the brand's earliest major release for the NFL, Finest was first available for football collectors in a 1992 factory set. Just like the basketball and baseball products, the new technology and Refractor parallels made 1994 Topps Finest an immediate standout in the collecting world. Officially a 1994 product, the checklist for 1994 Topps Finest Football is more like a late-1993 release since none of the 1994 rookies are available. 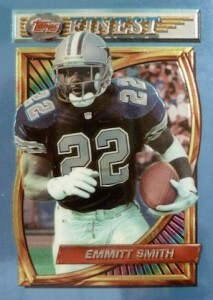 The 220-card base set includes 37 Rookie Star subset cards that were all part of the 1993 NFL Draft class. Although the Rookie Star cards are not officially recognized as rookie cards, the top players, like Jerome Bettis and Drew Bledsoe, do see a slight bump in value. The primary base design includes a large, light-blue border with a iridescent frame featuring a football-shaped opening. The Rookie Star subset is a little more simple and includes football field yard lines along with a cloud-like design. Mirroring the base set, Refractor parallels make their football debut, averaging around two per box. Over time, the values have come down considerably, but the Refractors remain the primary focus of the product. Still producing confusion for some collectors, Refractors were not noted on the cards early in the Finest history. However, they are quite easy to distinguish when compared against a regular base card and are best described as featuring a rainbow effect when rotated in light. Lastly, an oversized box topper parallel (4" x 6") for the Rookie Star cards is found in each box. Individual singles remain common, but sealed boxes can offer an inexpensive 1990s break and are normally found in the $40-50 range. Each box comes with 24 packs of six cards and a single card affixed to the front of the box. 220 cards. Shop for complete base sets. 37 cards. 1 per box.